Passing through the Chatham break, I squinted slightly as the sun broke the horizon. That first pink-orange glow of the day is one of my favorite sights, when the water changes almost instantly from a bluish-black to a gorgeous bright blue. Turning the boat and heading to the southeast, I saw a few splashes and some nervous-looking water. As I drew closer, several bluefish broke the surface, then a few more joined in, and soon I was all alone in the middle of a beautiful bluefish blitz. Ordinarily I would have grabbed a spinning rod and thrown a metal lure at them, but that day was different. I had planned to try my luck at saltwater fly fishing and been presented with a golden opportunity to catch one of my favorite saltwater fish. I headed to the bow and stripped some line off the brand-new reel. I was so excited that my hands shook as I made my first cast – or at least tried to. My first attempt fouled on the rail, and the next one nearly caught my right ear. Fortunately, my third attempt actually set down about 40 feet out into the water. I stripped the line steadily, bringing the fly through the jumping, splashing blues. The fly came back to the boat untouched, but the rush was incredible. I made another cast, this time adding about 10 feet, and started stripping the line in just after the fly hit the water. Almost instantly I felt a strong resistance in the line in my left hand. I strip-set the hook and felt a direct connection from my hand, through the fly line, to the fish, and I was on. It wasn’t the biggest bluefish I’ve ever caught, but certainly one of the most memorable. Since that moment, saltwater fly fishing has become my passion. Fly fishing is often perceived as a difficult and expensive sport to pursue, but it doesn’t have to be either of those things. Unfortunately, when people look into taking up saltwater fly fishing, they get a glimpse of some high gear prices and instantly drop the idea. Looking at the vast array of choices in a fly fishing catalog can be very intimidating, especially when top-of-the-line gear is promoted and can reach astronomical prices. The first time I considered saltwater fly fishing, I dismissed the idea as too complicated and expensive. However, with a little more research, I found that you don’t need to over think it when you’re just getting started. I’ve found that there are many great options that won’t bankrupt your kid’s college fund. Read this short guide to saltwater fly fishing for beginners and you’ll be shaking with excitement at the prospect of you’re first saltwater fish on the fly in no time. The first thing you will need to buy is a rod. There as many opinions about fly-rods as there are fly fishermen. The only “rule” is that you should find one you are comfortable with. The relationship between fly rod and fly fisherman is a very personal one, and you’re the only one that will know when it’s right. Having that said, there are some guidelines that can give you a place to start looking. First, pick a versatile rod for your first outfit. I fish mainly in the Chatham, Cape Cod area, which includes both the Monomoy rips, the harbors, bays and estuaries, and everything in-between. Advanced fly fishermen might want a bunch of different rods to do all this, but you don’t need to specialize when you’re first starting out. The best multi-purpose rod for New England stripers and bluefish is probably a stiff 9-weight. I know many fishermen who think you need a 10- or 11-weight rod to catch striped bass, but I really think that’s overkill. I’ve caught 40-inch bass on an 8-weight rod in the Monomoy rips. A 10- or 11- weight rod would probably have made the job easier, but I would also have had to throw a heavier line all day, which gets tiring. Unless you are specifically hunting for trophy-sized fish, a 9-weight rod will give you plenty of strength. 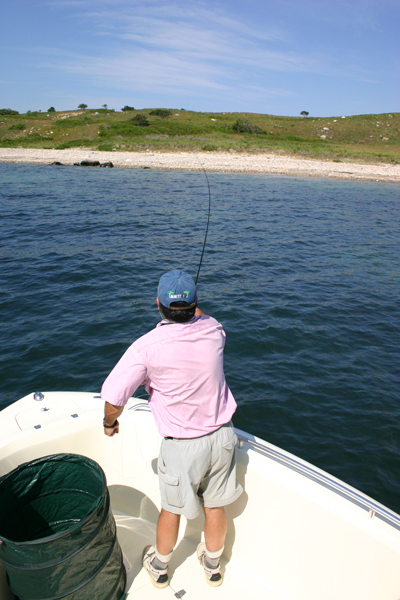 For length, 9 feet seems to be ideal for New England saltwater fishing. Boat-fishermen might prefer a shorter rod and shore fishermen a longer one, but a 9-footer will give you a big selection to choose from and get you started. The next choice you have to make concerns the action of the rod. There are several terms that describe the action of the rod, but to put it simply, it’s all about stiffness. I have always preferred a stiffer action in a fly rod. While this can make learning slightly more challenging, it will also make it easier to cast a heavy sinking line. These rods are often referred to as “tip stiff” where a lighter action rod would be a “full flex.” Full-flex rods work better for short casts and light lines. A 9-weight combo like this one from Orvis will get you in the game for under $250. After you’ve got a rod, you’ll need to find a good-quality matching reel. The first choice to make when choosing a fly reel is the drag type. There are two main drag types: center and offset. Center drag reels seem to have the most stopping power but come with a higher price tag. It’s important to have a good drag, but if you’ve got extra money to spend, use it on the rod because you will never need the drag if you can’t cast the fly to the fish! Offset drags work well too, but you may have to “palm” (touch your palm to the rim of the spool to slow the fish) the reel on a big fish. Fly reels come in large, mid and regular arbor sizes. The arbor size refers to the diameter of the spool. Larger diameter reels will wind on more line per turn of the reel handle. I prefer a good mid-arbor reel, such as the Orvis Battenkill Mid-Arbor, that also has a center drag. Another good reel is the Orvis Rocky Mountain Large Arbor. This reel has an offset drag that provides adequate pressure. If the basic New England saltwater setup is a stiff, 9-foot, 9-weight rod with a matching reel, then the next step is to find a rod and reel that won’t break the bank. There are several places that I would look for an affordable setup. The first is a local tackle shop. A good tackle shop will carry gear that is appropriate for fishing local waters, and often they’ll have a good rod and/or reel lying around that they haven’t been able to sell. It might be an older model, but remember, you don’t need the newest, shiniest setup to get started. If you don’t have any luck at the local shops, the internet is the next place to look. Ebay often has phenomenal deals on tackle, as many retailers will sell their excess wares on the site at a substantial discount. Make sure to check the condition and look for equipment that says “new with tags.” Another sure way to find a good, inexpensive rod is through online stores like Bass Pro Shops or Cabela’s (basspro.com, cabelas.com). Check their sale or clearance sections for great deals, and consider their rod-and-reel combos, which can save you some money. Many reputable rod makers also offer an entry-level line of rods. I’ve had really good luck with the St. Croix entry-level models. They are great rods, and they always seem to be on sale. Temple Fork Outfitters (TFO) is another fly-rod manufacturer to look at. These are top of the line rods with reasonable prices. Orvis also makes an affordable line of rods and reels called the “Clearwater” line. As far as line is concerned I almost exclusively use a full-sinking line. Unless I’m on the flats, I want the line to sink, the faster the better. I use a 325-350 grain line on my nine-weight rod. This gets the line down fast and isn’t too heavy for a long day of casting. Rio makes some good lines as does Scientific Angler, both at a reasonable price. When it comes to backing you can use 20-pound test braided Dacron. This is inexpensive and works great. 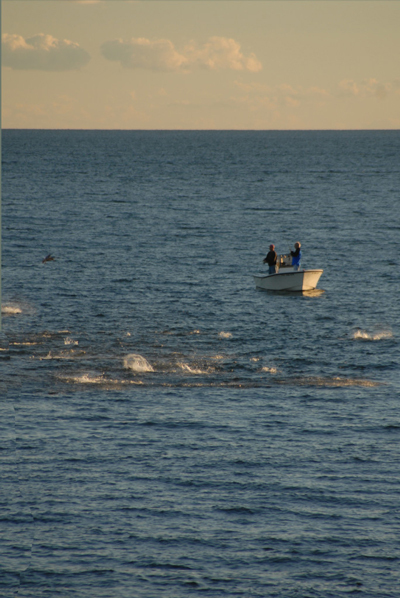 Most reels can hold at least 200 yards of this so unless you hook that bluefin tuna you have plenty to work with. Don’t bother with the 30-pound test Dacron or gel-spun. The leader is far more likely to break than the 20-pound test Dacron so going any stronger with the line is unnecessary. For leader material the easiest thing to use is 15-20-pound test fluorocarbon. Thirty yards will last you for a season or two and only set you back $15 or so. The tapered leaders are great but I’ve never seen a difference in the way fish respond to them except in very shallow water. You can become a decent fly caster within a day or two with a little practice. After you’ve got your rod, reel and line you will have to figure out what to do with them. If you’ve fly fished in fresh water before, it will come quickly to you, the transition shouldn’t be that difficult. It’s just a bigger, heavier rod. If you’re a beginner saltwater fly fisherman then you can try to teach yourself (which can be difficult) or find yourself a teacher. The fastest way to learn is to befriend a fly fisherman and cajole him or her into teaching you. If you’re not this lucky, there are other good options. Hiring an instructor or going to a school is a good way to learn but can be costly. (If you have a birthday coming up, this might make a great gift.) If not, there are a few good books out there on learning to cast. Lefty Kreh has several good books and his humorous writing makes learning enjoyable. If you’re a visual learner, find a DVD that offers instruction. There are several DVDs out there that are great, including ones by Lefty Kreh and Flip Pallot. Orvis also offers instructional DVDs. There are also several good, free instructional videos on the internet that can really help you. I highly recommend watching these. You can become a competent caster in a day or two with a little practice. It takes more experience to become a truly good fly-caster, but in a weekend you can develop a technique that will at least allow you to get the fly to the fish, which is the name of the game. I would recommend casting in a field or open area somewhere before getting out on the water. It’s a lot easier to learn when you’re not dealing with a rolling boat, or sand and water on your line. One of the most crucial pieces of fly fishing equipment is also one of the smallest, the fly itself. Fly selection is largely dependent on where you will be fishing. You do not need 50 different patterns to be successful. A few of the basics will get you started. Talk to your local fly shop on this one. They will be able to guide you in the right direction so you don’t have to experiment with several different patterns and spend money on ineffective flies. That said, there are some flies that are essentials for New England saltwater fly fishermen, like the chartreuse-and-olive Clouser Minnow . These flies can be used in six inches of water on the flats or in 60 feet of water. Fly fishing is one of the most enjoyable ways to spend a day outside. It can be both relaxing and exciting beyond words, and feeling the fly-line come tight in your hand will give you a rush you won’t quickly forget. At first it seems like a daunting task to become involved with this wonderful pastime, but with a little research you can find all the gear and tackle to have just as much fun as the guys with the most expensive gear, and you’ll have money left over to put gas in the boat! You don’t even need a tapered leader, just 7 or 8 feet of fluorocarbon leader; the same leader material you use for spin fishing. Excellent article. As a seasoned freshwater fly fisher, this article is an awesome resource for someone just entering the saltwater (and fly fishing in general) world. I’m looking at putting together a fly rod setup for keeping up with my friends during striper season on the NH/Maine coast. Dennis for redfish and snook a 9 wt should work. but for tarpon a 12 wt is more realistic. bones and permit are an 8 or 9 wt rod. Thanks for the tips. I’ve done a fair amount of freshwater fly fishing, but never ventured into salt water. With a few days on the North Carolina coast in my near future, I look forward to putting your advice to use! Nice article,thanks for the tips! Picked up an orvis Clearwater . I’m still a novice but this setup is working for me. Just got back from Canada and caught cohos from the beach!! What a rush ? .back in Cali . Going to look for tuna today . My surfboards are getting dusty oh well what can I say I’m hooked . Great read!! 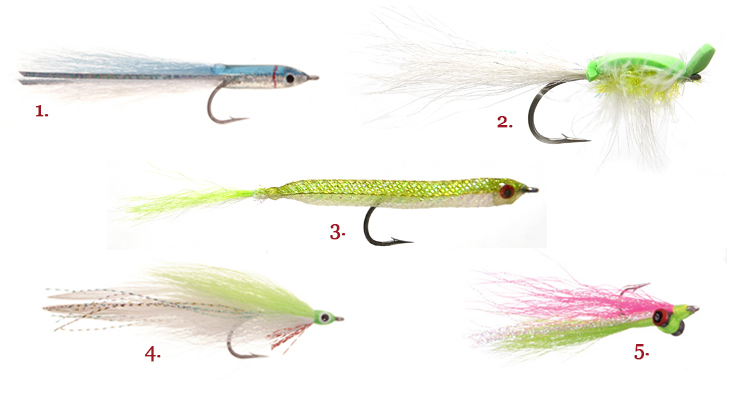 I am an avid saltwater fisherman and have been looking to get into the fly game! This article made me salivate and I can’t wait to get going on this new endeavor!! Freash water flys were my chooce for many years up state NY fished the race up at the cape in my youner days now have moved to NJ live by the beach n its a 2hr drive to good freash water n the beach is 3mins away so at 68yrs its time to change thank you for your giudence !! !tite lines!!! What are your thoughts on stripping baskets? A necessity? I’ve been persevering with the fly in salt water on the west coast of Scotland on the sandy coast of Dumbarton near the mouth of the River Leven. I have had some luck with sea trout and small bass but there are shoals of thin lipped mullet who appear impervious to the lure of the fly and are very “shy” takers. Thanks again for the article and if there’s a lottery win in my stars the first flight will be to the bones on the coast. it was a very awesome article with lots of information decent tactics. 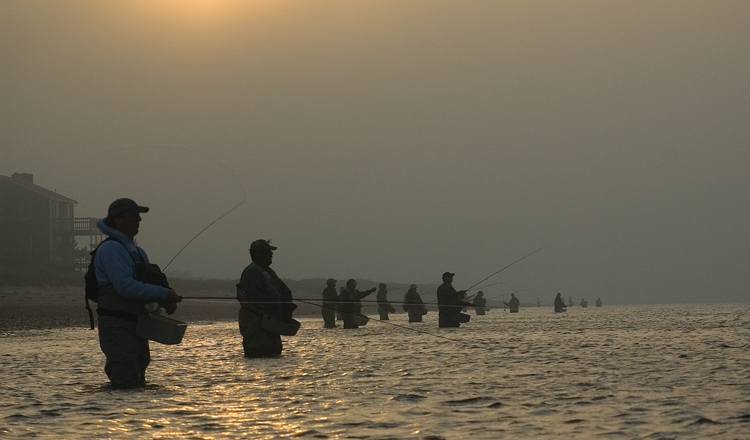 Fishing is one of the sea sport. I have been using fishing rods as an equipment for fishing. And we supply latest model boats suitable for fishing and sea sports. Thanks for sharing. Great Article, very encouraging words for a novice like me. What type of line do you recommend for San Diego coast line – La Jolla? Thx a ton! Thanks for putting it out there. I have been using a 7 wt for early season schoolies with sinking tip and clousers. 9 wt is overkill if you want a softer presentation and the water is dead calm. I talked to a former striper flats guide in NH and 6 wt is what he used for schoolie stripers. Enjoy!! Great article. I used to fly fish up in the Templeton Mountains in CA. Would like to try it at surf level sometime. I am writing a novel which includes surf-fishing during 1948. Can you give me the type of equipment used for that era? I’ve tried the internet, but to no avail. I thank you in advance. Thank you. I learned a lot for a good start on saltwater fly fishing.